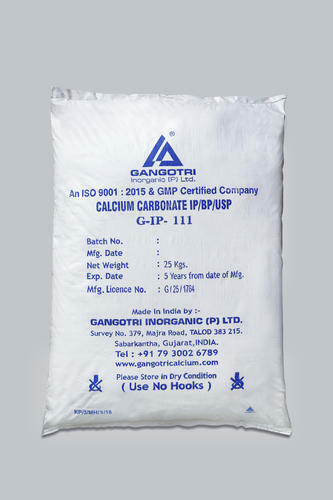 Gangotri Inorganic (P) Ltd., an ISO 9001:2015 & GMP certified company is one of the leading Manufacturers, Suppliers and Exporters of this highly commendable range of Inorganic Chemicals, was established in the year 1997. The offered range comprises products like Calcium Carbonate Precipitated IP BP USP EP JP, Calcium Carbonate Activated (Coated), Calcium Oxide USP JP, Calcium Hydroxide BP USP EP JP,Purified Talc IP BP USP and many more, having a high preference in the market. The offered range is manufactured in compliance with the chemical industry set norms, utilizing the finest ingredients. Owing to this, the offered products have a longer shelf life and an impeccable effectiveness. Further, the range is widely acclaimed for its highly reasonable pricing. Our highly futuristic infrastructural facility is equipped with all the required machinery and equipment, for attainment of the firm’s goals and objectives. Its regular up gradation, helps in maintaining of the firms goals and objectives. In order to attain better management and finer operations, the facility is been divided into a number of highly operational units, lead by skilled professionals. These units work in a united manner, to improve the firms production capacity. In addition, our ethical working habits have helped us generate a huge client base.